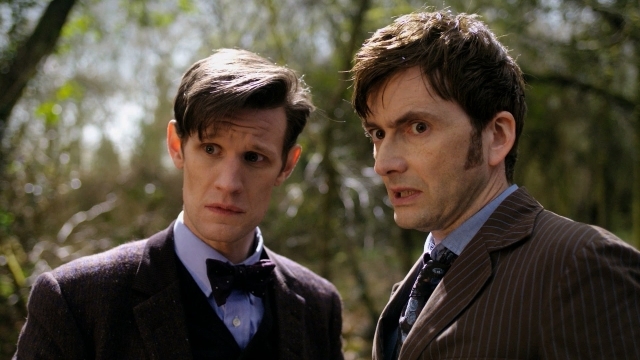 Though Doctor Who doesn’t return to TV for another six months, April is still a good time to be a Whovian. BBC are releasing four new novelizations of 21st century episodes of the show, written by a bunch of the series’ top writers. And one that’s definitely a must-read is The Day of the Doctor novel, which will expand on the already jam-packed 50th anniversary special. The book is written by the original episode’s scribe Steven Moffat, the man who was in charge of Doctor Who from 2010 to 2017. While chatting about the process of translating “The Day of the Doctor” from the screen to the page, Moffat revealed that it was a hard task, as the episode changed so much from the shooting script to the actual broadcast special. That’s not the only way it changed over the production process, though. Moffat has previously unveiled snippets from his very first draft of the script, which featured Christopher Eccleston’s Ninth Doctor in place of John Hurt’s War Doctor. This original plan was ditched, however, when the former actor backed out of the project. Moffat then went on to talk about how it was also a challenge to adapt visual moments into prose that were engineered to be viewed. For instance, how can Tom Baker’s shock return towards the end of the special work when reading it on a page? The other novels being released by the BBC include the Twelfth Doctor’s swansong Twice Upon a Time by Paul Cornell, David Tennant’s debut A Christmas Invasion by Jenny T. Colgan and, last but not least, Christopher Eccleston’s first story Rose, adapted by its original writer Russell T. Davies. Like Moffat’s Day of the Doctor, Davies also embellished his TV work in his novel. In particular, he used the book to predict some future incarnations of the Time Lord. The novels are now available from BBC Books, while Doctor Who season 11 starring Jodie Whittaker as the Thirteenth Doctor, arrives on our screens this October.